At the first day keynote at Triangle Game Conference '10, Insomniac expansion Studio Director Chad Dezern explained the essence of the Ratchet & Clank studio's development, and how they transported it all the way across North America. When he took the podium to start his keynote presentation on the first day of the Triangle Game Conference 2010, Dezern apologized in advance - there's quite a pollen crisis happening down in our neck of the woods, you see, and he was allergic. He warned that there might be sneezing... and yet, miraculously, there never was. When the Burbank, California-based studio decided that it wanted to open up another branch on the other side of the country, said Dezern, it was because they felt they had a "way of making games worth expanding - a philosophy we've come to love." If you asked him to encapsulate that philosophy in one short sentence, he continued, his response would be "No, I'd rather not do that." But if you persisted, Dezern admitted, he'd sum up Insomniac's philosophy thusly: "We create the kind of games we'd like to play." As an example, he related an anecdote about a conversation that had taken in 2000 on a Burbank rooftop - the team had just finished Spyro 3, and the developers were trying to think about what they wanted to make next. "We all knew that we weren't going to work on another game about a quadruped," he chuckled, "We wanted a character who could hold something." After some discussion, the ideas were off to a slow start - but Insomniac eventually began work on a game about a girl with a stick, called... "Girl With a Stick." It was a working title, naturally. However, even though there wasn't "anything terrible about that idea," as the game shaped up as a third-person action title with fantasy elements, the team's heart wasn't in it. "Our hearts were just never in it. We could have probably pushed that idea and made something, and it could have turned out okay, but it wouldn't have ever realized its potential." Instead, the decision was made to scrap "Girl With a Stick" and start over - and instead of designing based on external factors, like the popularity of Zelda or Tomb Raider, said Dezern, everyone just contributed their own ideas. Studio co-founder Brian Hastings eventually suggested a simple idea: Why don't they make a game about an alien who travels from planet to planet? 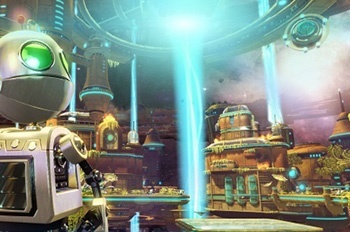 That one idea sparked the team's creativity, and in just three weeks animators and programmers and designers had a rough demo that would eventually become the first Ratchet & Clank. "We gave ourselves the permission to make a game we wanted to play," said Dezern. The studio enjoys a challenge, said the Insomniac boss, and pointed to two of its series - the dark, gritty FPS Resistance and colorful action platformer R&C - as evidence that they wanted to work on games that were different thematically, not just mechanically. "Ideas come from everyone," he insisted - every member of the team could have input on something that could end up being great, from environmental art to animation to raw programming, and it was just important to foster a culture in which the "best idea wins." Not only that, but it was important to play ping-pong with even the ideas that worked the best to make them better: An artist draws an area, a level designer plans it out in a map, an environment designer models it in 3D, and each of them add and tweak at each step of the way. "'This is really cool, but how about a little bit of this, too?' We really trust this process - it's worked really well for us," said Dezern. "Your first idea doesn't have to be right or perfect; that never happens! It's only through the process of refinement that something good comes out." That was the culture that Insomniac tried to move to North Carolina, with its high quality of life, its proximity to several major universities, and its "delicious barbecue." While Dezern couldn't tell us what his studio branch was working on - it's been quite the top-secret project - he did say that so far, things were looking up. "We hope that the work we're doing in the Triangle serves as proof that Insomniac's culture is portable," he concluded.